Knitting Relaxes Me: What's in here? 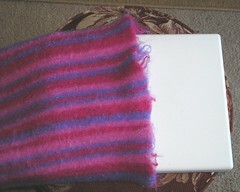 Why, it's a felted laptop sleeve containing my iBook! Yes, after blocking all weekend on the cake pan, the laptop case is big enough for my iBook. It's exactly as I imagined it -- a close-fitting sleeve to give a little extra protection to my computer when I'm carrying it around in some sort case. 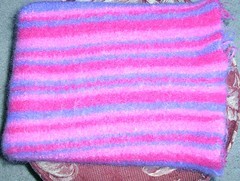 The store-bought sleeve that I have for it goes a little overboard on the padding! However, now that it's all done, I do wish it was long enough for me to cut a slit for a handle, as it's shown in the pictures. I probably wouldn't ever carry it that way, but it might make airport security maneuvers with it a little easier. Despite that, I'm very please with it! For now, I'm leaving the 'fringe' around the open edge, although it's dreadfully uneven. If i get tired of it, I can always trim it off! The patterns says it will take two skeins of each color, but for the smallest size I only needed one each. My slightly looser gauge meant that I got the desired length before I finished all the color repeats. The Lamb's Pride felts fast! I wish I had taken it out around 15-16 minutes, rather than 18 or 19.